Alfresco Process Services (powered by Activiti ) is an enterprise Business Process Management (BPM) solution targeted at business people and developers. At its core is a high performance open-source business process engine based on Activiti with the flexibility and scalability to handle a wide variety of critical processes. Alfresco Process Services provides a powerful suite of end user tools and integrates with a range of enterprise systems, including Alfresco Content Services, Box and Google Drive. The Alfresco Digital Business Platform is an open, modern, secure platform that intelligently activates process and content to accelerate the flow of business. It provides the fastest path for people to interact with information and for companies to respond to changing business needs. Alfresco is the enterprise open source company focused on making business flow quickly, seamlessly and intelligently. Alfresco software powers the daily work of more than 11 million people at industry-leading organizations in 195 countries worldwide. Alfresco and Cisco partner to improve document management processes for the global Cisco sales team. 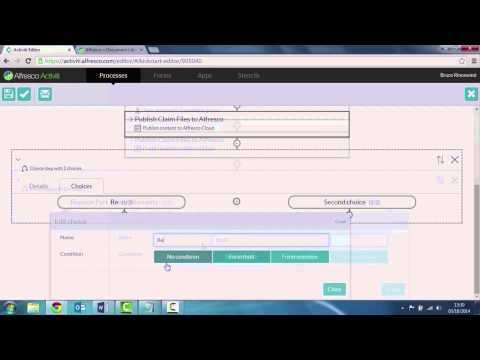 Video demonstration of Alfresco Activiti version 1.0 - Powerful Business Process Management (BPM).